The Hoffman Brick and Tile Company was originally established in Albert Street Brunswick in 1870. They expanded in 1884 to 70 acres after Buying 36 acres in Dawson Street, making it the largest brickworks in Victoria. The Melbourne suburb of Brunswick was known for its deposits of clay, so it became a centre for pottery production. Bricklaters had been using the clay since the 1840s. At the end of the nineteenth century, there were more than a half-dozen potteries operating in the Melbourne inner suburb of Brunswick. As well as Hoffman Brick, Tile and Pottery Company (1862-1990), (the largest of these), There were Cornwell’s Pottery, Gillbrook Pottery, Victorian Art Pottery, Federal Pottery, and the Brunswick Brick, Tile & Pottery Works. From the 1880s, Bendigo Pottery was the largest in the state until overtaken by Hoffman's Pottery in the early twentieth century. Brunswick Pottery and Brickworks produced pipes, water filters, chimney pots and terra cotta. The Brunswick Pottery continued in production until the early 1950s. During the 1870s the Brunswick Pottery established a branch in Launceston Tasmania that it later sold to John Campbell in 1881. This became the first Australian pottery to use electric power and changed its name to Campbell’s Electric Pottery and in 1926 to J. Campbell Pty Limited. It produced pipes and a range of domestic pottery up until 1959. Hoffman were originally started for the purpose of brick making, but by 1900 were producing a large range of architectural and garden ornaments as well as Bristol ware crocks, canisters, bottles and jars for commercial and domestic use. The production of domestic wares at Hoffman’s was finally phased out in 1960. David Dee, one of the founding partners of Premier Potteries in 1929 (makers of the Remued art wares), and teacher of Allan James, had previously earned a reputation as an expert thrower at the Hoffman works. Hoffman’s was known primarily as a maker of bricks and tiles, with a sideline in domestic pottery. Around 1930 Hoffman introduced the colourful and commercially successful line of decorative pottery called ‘Mel-rose Australian Ware’. This development followed Hoffman’s discovery of a new source of high-quality clay in Gippsland (south-eastern Victoria). Early pieces were wheel-thrown, but as the newer practice of slip casting (pouring a runny clay mixture into a plaster mould, then drying, removing, decorating and firing the piece) was mastered, the firm’s capacity to meet the growing demand for Australian plant and animal decor was greatly increased. These wares were sold by leading department stores like Myer and Mutual Stores. It was a great success, and is said to have been the only thing that kept the company solvent during the Great Depression. 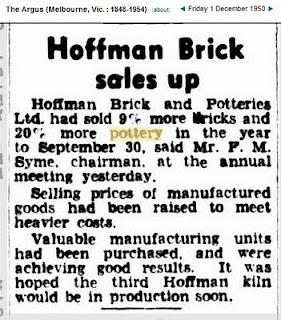 During the 1930s, Hoffman Brick and Potteries Limited became one of the largest businesses in Melbourne. “Hoffies” became an integral part of Brunswick community life. Whistles for wake up, starting and ending the workday, the ever present clay dust, the glow of the kilns, the constant hum of machinery and ‘smoke free’ Mondays in deference to the weekly wash day. Their distinctive Mel-Rose glaze combinations are said to have been the intellectual property of Francis Manallack, an expert in all facets of pottery-manufacture but especially glaze-making. Francis had spent many years working for Cornwell’s pottery (also in Brunswick), he worked for a time as a chemist for the Melbourne Glassworks, and taught classes at Brunswick Technical School. He contributed his glazing expertise not only to the Mel-rose line, but also to Mc Hugh Brothers art ware, leaving his mark several times over in the history of Australian pottery. Merric Boyd, sometimes described as the father of art pottery in Australia, had his pots fired in Hoffman kilns in the early 1930s after he burned out his own. Merric is also thought to have modelled some decorations for use in the Mel-rose line. Allan Lowe, William Ricketts, John Barnard Knight and Klytie Pate are other studio pottery artists who were associated with Hoffman’s at one time or another. In 1941, Hoffmans closed their Albert Street quarry as the clay deposits were becoming depleted. In 1958, Dawson Street was sold and used as landfill. Now Gilpin Park, it is an Oasis in a suburban area. With the closure of the pit and other parts, the site had been effectively reduced to the central brick production area and remnants of the pottery production area. The buildings and plant of primary individual Significance are the three Hoffman kilns, the machinery associated with the brick pressing plant and the structure housing it. Hoffman was purchased by Clifton Brick in 1959 but continued production until 1962. Pottery was being slowly phased out in the early 1960s. The company was then acquired by Nubrik in 1986 with the site eventually closing in 1993. One of these ramekin is stamped "Hofmann Australia" to the base. Another has a paper sticker which says "Hoffman Pottery Famous in Australia since 1862". Paper stickers replaced stamping and incising as an easy means of marking pottery for high volume production. There are lots of them around, but because the stickers wear off easily, they are unmarked.